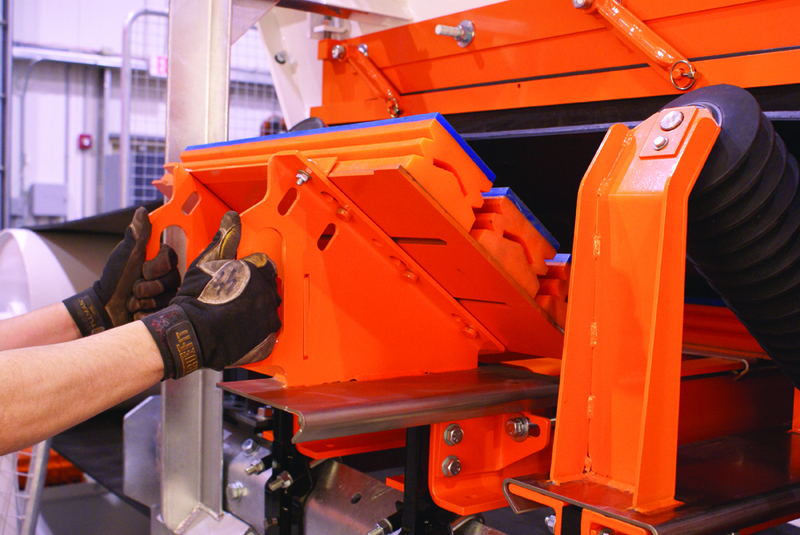 A rock box acts like a shelf, catching and distributing falling material onto the impact cradle. 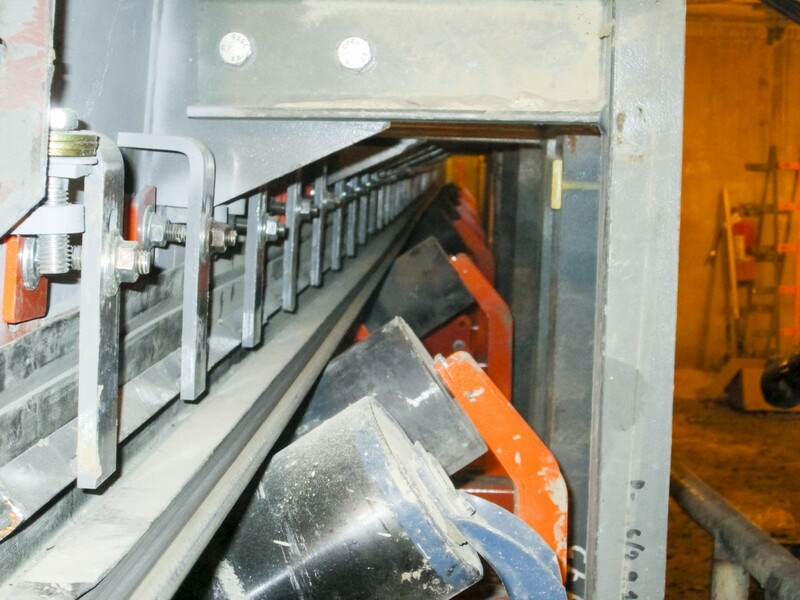 [New Braunfels, TX] – The largest cement producer in the state of Texas has eliminated a source of fugitive material and equipment damage on one of its essential conveyor arteries transporting crushed limestone from a storage dome to two kilns through an underground tunnel. 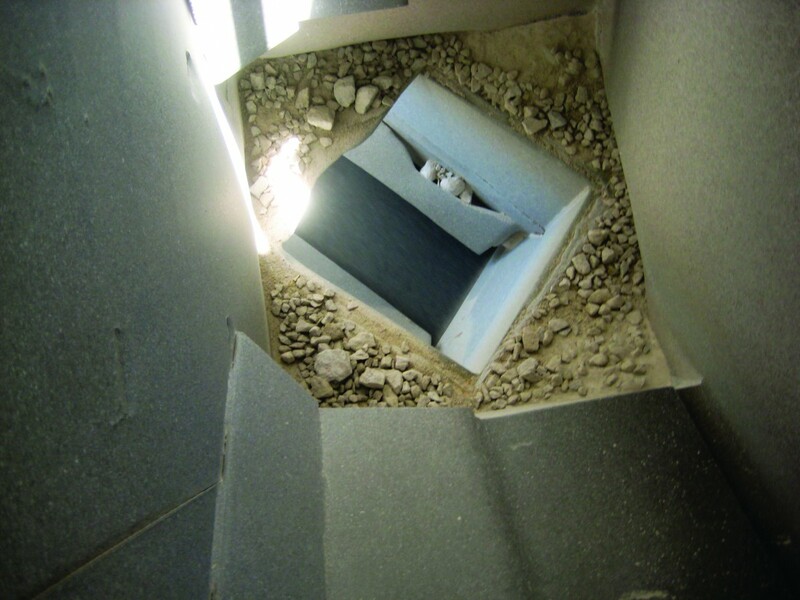 The Martin Marietta facility in New Braunfels adopted several technologies from Martin Engineering to mitigate the effect of drop forces from 8-inch minus rocks falling 20 feet onto the B-06 conveyor, including a rock box, impact cradle, settling zone and skirt sealing. Installed with a series of belt trackers to maintain proper alignment and a V-plow system to protect the tail pulley, the upgrades are helping the Hunter plant in New Braunfels avoid belt and idler damage, spillage and downtime. The Hunter Cement facility has a large quarry that extracts limestone and sends it to a 60,000-ton storage dome, which is over 320 feet in diameter (97.5 m). From there, approximately 350 to 400 tons (317.5 to 362.8 metric tons) per hour of limestone is loaded into a crusher that breaks down the rock to 8-inch minus in diameter (203 mm), then deposits the material into a chute with a 20-foot (6-meter) drop onto a 42 inch (1066 mm) conveyor belt. The limestone is conveyed at 380 feet per minute (1.93 m/sec) at a 35-degree incline for 150 feet (48 m) through the tunnel and 150 feet in open air, then directed to the proper kiln to be mixed, heated and processed. The modular impact cradle absorbs the impact of the falling load, yet slides in and out for easy service. Located directly under the chute, the impact cradle is mounted on four rugged steel I-beam supports, able to sustain an impact force of 12,000 lbs (5,443 k). The specially engineered impact bars are based on an aluminum T-slot design, which is surrounded by a layer of energy-absorbing 83A durometer urethane and coated with low-friction UHMW plastic to reduce friction and belt fraying. Following the impact cradle within the 34-foot-long (10.3 m) settling zone, the team recommended a series of adjustable slider cradles that support the belt to prevent spillage from belt edge sag and to eliminate entrapment points where material commonly got caught. Another key element of the assessment was an external skirting system along the chute box, sealing the chute to the belt. Specially designed to provide dual-seal efficiency with a one-piece 70 Shore D EPDM durometer rubber composite skirt and an attached strip, the skirting floats on the belt and self-adjusts to maintain an effective seal. The external skirting system seals the chute to the belt. “The wandering belt was a big concern, so we recommended a series of belt trackers with a parallel steering and training system every fifty feet,” Cole added. “Another cause of misalignment was material getting caught between the belt and tail pulley, so we proposed a torsion V-plow as well.” Mounted on a dual steel bar attached to the mainframe a few feet from the tail pulley, the V-plow has a unique suspension system that allows the polyurethane blade to rise and fall with fluctuations in belt tension. Any material carried back on the top of the belt return is deflected to either side of the frame before it reaches the tail pulley. Installation by Martin Engineering technicians took less than two weeks, and coincided with scheduled breaks for other improvement projects addressing issues throughout the facility. Since the conclusion of work, monthly Walk the BeltTM inspections conducted by Martin Engineering technicians have recorded healthy pulleys and no significant belt damage or need for replacement. Spillage cleanup time has been significantly reduced to an as-needed basis, without the requisite system shutdown.